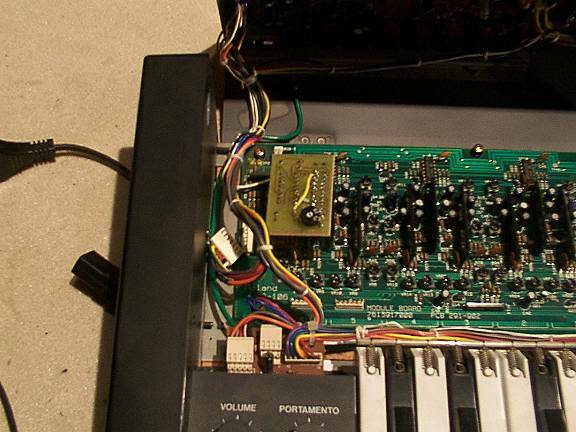 The most common problem with juno-106's is one or more of the voices going dead or that keep hanging. 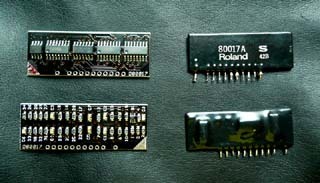 The problem is the poorly manufactured 80017A or 800170 IC (short for A1QH800170 or A1QH80017A) custom vcf and vca ic. 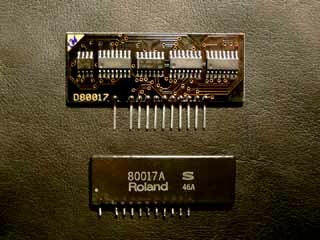 Since these ic's are no longer manufactured and roland has no spares for them anymore, we are forced to scrap other 106's for spares. Which is not a good idea because every single one of these ic's will die. Therefore I did some research on those ic's. 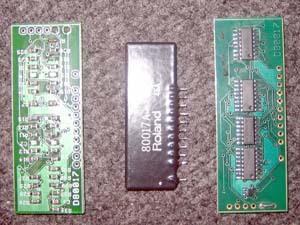 First I designed a vca clone, that only took over the vca of the 80017A, but still used the vcf part (if that was still alive). This design was completed at the end of 2003. Numerous of these ones have been sold and installed to great succes in juno's worldwide. After that I continued my research on this ic with the goal of designing a full clone of it. 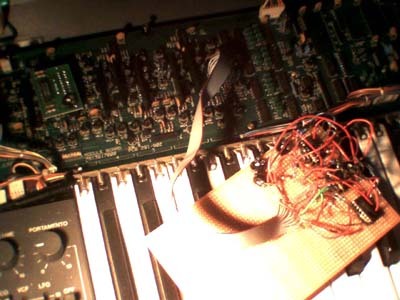 This was a particulary hard job because only little is known about the intestines of this ic: only the rough outlines which are displayed in the juno-106 service manuals and the little info that is available on the IR3109 and how it is used. It took no less then 6 restarts from scratch until I had a prototype of which I thought that it was on the right track. The bigest problem was the creation of an exponential current source that has the same error and temperature tracking as the one inside the IR3109 (of which no one knows how it was built). When this problem was solved (about nov 2004) I could start doing signal analysis on both an opened 80017A and my design, to adjust gain levels so that the non-linearities (tanh) of each stage were the same. This was done on the spaghetti prototype displayed below (summer of 2005). 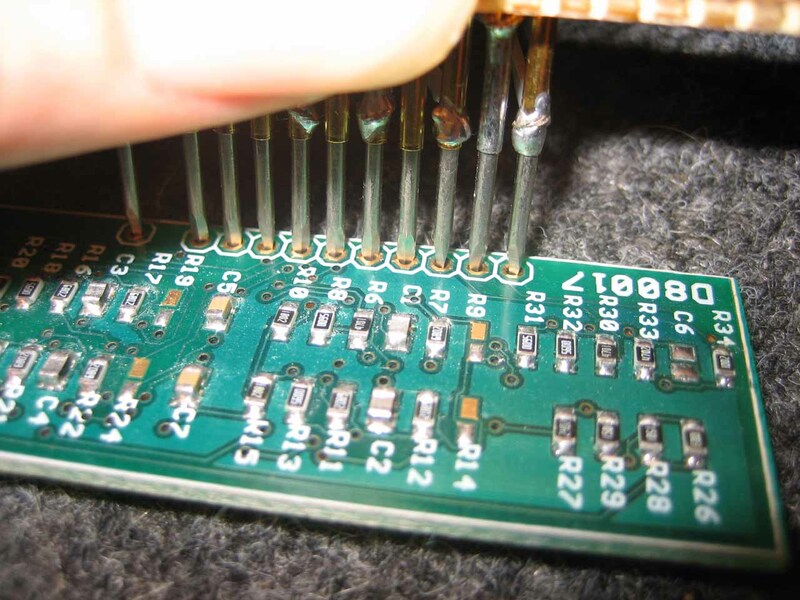 After that I designed a smd prototype for further testing which surfaced more problems: strange behaviour with resonance at very high and low frequencies, which were all solved by the end of 2005. At this moment I was unable to measure nor hear any difference between the original and the clone. 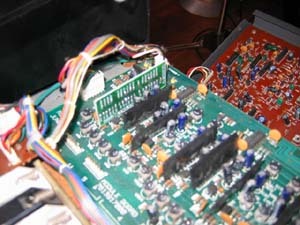 After that I built some more prototypes and installed these in 4 different juno's owned by different people. These have been in test for several months now and none of these people were able to tell which voice had the clone. 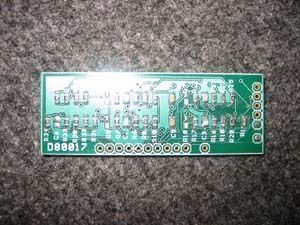 After that only minor changes (pcb-design)were done until the final design which has been for sale since may 2006. The first version of these clones has been for sale for almost a year and was installed in juno's all over the world. Not a single one has failed and nobody was ever able to hear a difference between my clone and the original chips. The answer is: A lot. - I redesigned the exponential current source of it. Now it has a much tighter tolerance and adjustment is now very close to the original ones. Trimpots should only need very slight adjustment now and will be almost in the center position for all settings if done correctly. This makes adjustment of vcf frequency and width easier. This does not change anything to the sound, it only makes them easier to install and it gives a good indication of a problem if a trimpot is way out center. - Complete redraw of the pcb layout. This allowed me not only to both increase the width of the pcb tracks and distance between them (This makes the pcb easier to etch and thus more reliable), but also to make the clone even smaller. This with more components on it than the previous version (due to the more complex exponential amplifier). Now it is only 55 x 21 mm where the original is 46 x 17 mm. - I added pins to them. You don't need to do that yourself anymore. 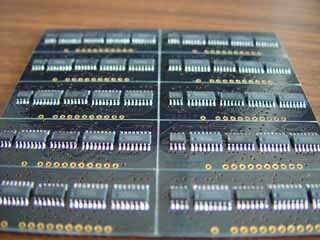 - Pcb's are now made by a different factory who's capabilities are far beyond those required to make the pcb's for these clones. 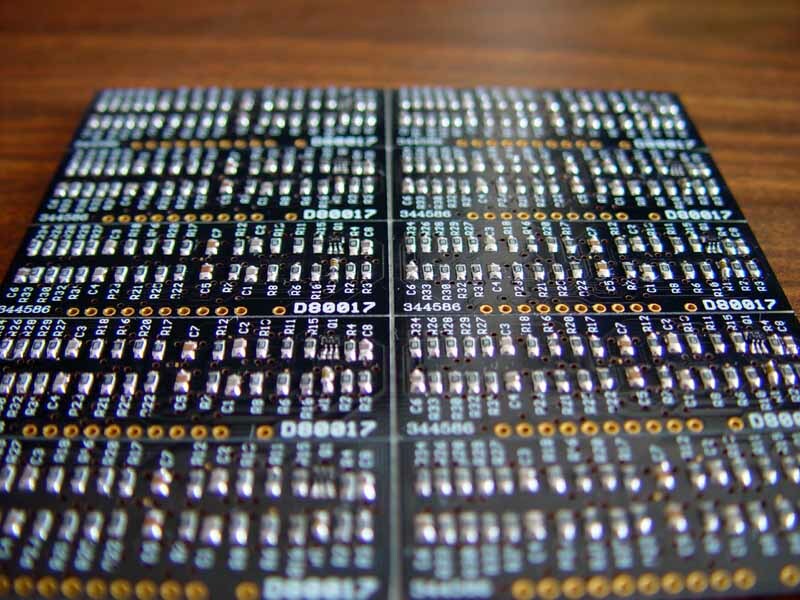 This combined with the pcb redesign should put their quality beyond comparison. - For aesthetic reasons my clones have now a black soldermask instead of a green one. 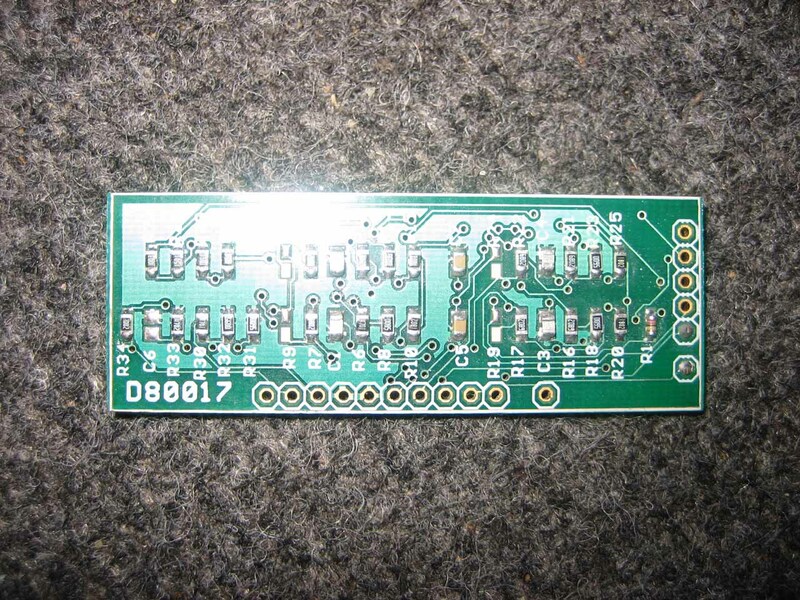 -Pcb layout is once again redrawn. Size is now only 52 x 19 mm. 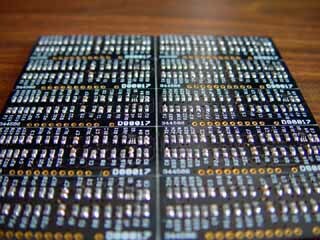 Which is now very close to the size (46 x 17 mm) of the original chips. -Completely machine assembled and soldered now. -Designed and built to the highest standard (take a look at the high-res images below to see for yourself). -No measurable nor audible difference with the original. I'm very serious about this and I'm well aware that my clone is the only one which sounds right and which behaves like the original. There are 2 other manufacturers of an 80017A clone: One of them asks you to adjust the other voices (with the remaining original chips) to make them sound like his clone. The other one has an issue with resonance disappearing at low frequencies and provides an extra resistor to put somewhere on the juno main pcb if the frequency is off. -All integrated components are in mass-production by more than one manufacturer and have been available for over a decade. Thus have a proven reliability and are easy obtainable(in the very unlikely event of failure). -Not dipped in resin. 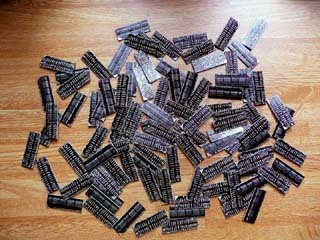 (the black plastic goo in which the original ones and other clones are encapsulated). 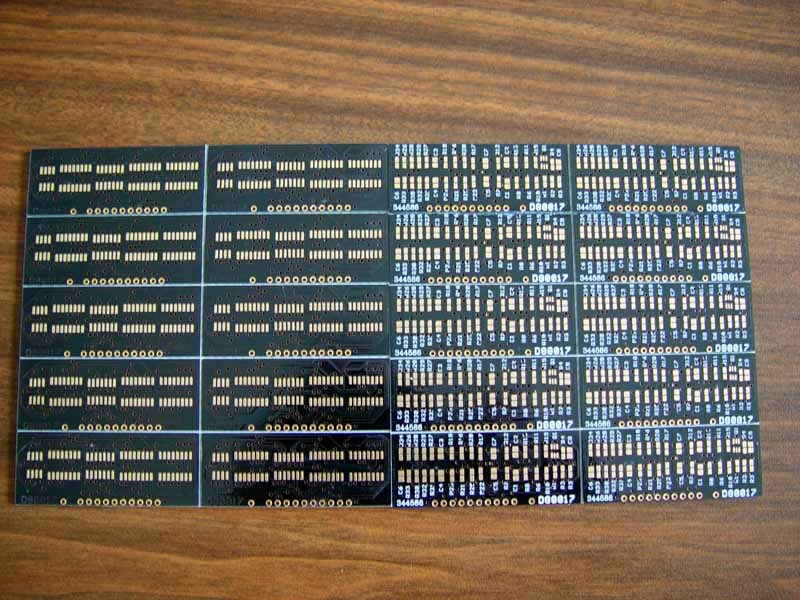 The original ones were dipped in it for protection due to the ultra thin pcb tracks and the printed resistors. 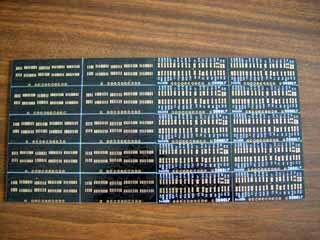 My clones do not need this because the quality of the pcb's is of the highest that exists and has real resistors instead of thin carbon printed on plastic. The only reason I can come up with why the other (poor) clones are dipped in it, is because the manufacturers of these are afraid of somebody copying their designs. I won't like that either, but I prefer providing something that has possibility to last for ever. I want all components to be accessible for replacement. (if ever necessary in the far future) As said before: they are mass products and easy to obtain. 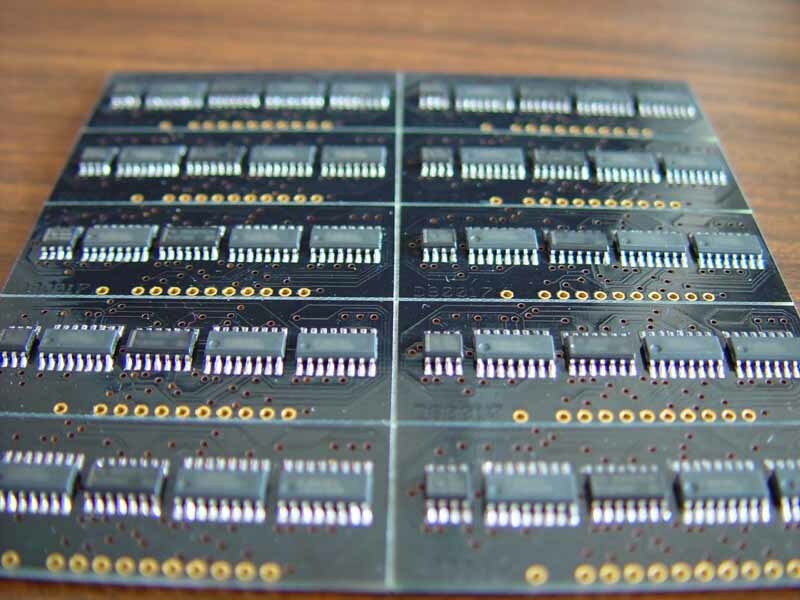 -Very high quality pcb: Immersion gold plated pads & holes. 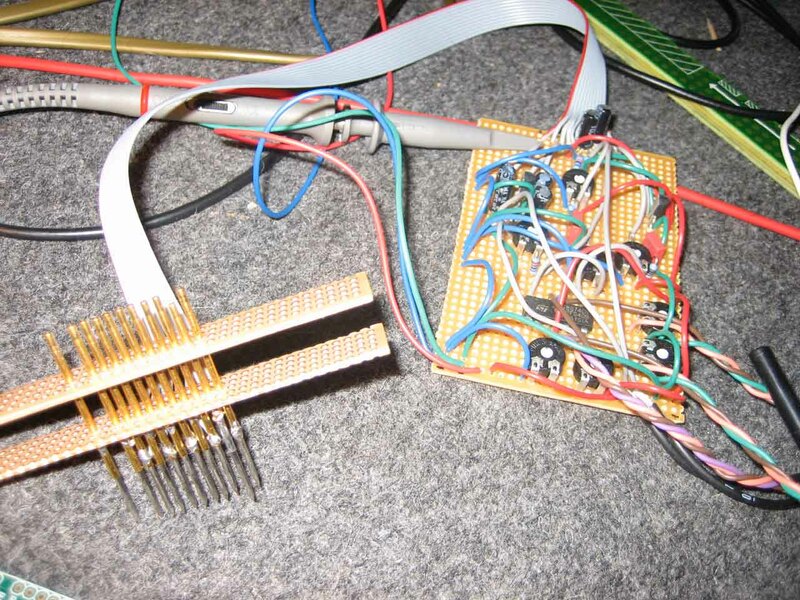 -All tested prior to shipping: I built a small bed-of-needle tester which does both an electrical test (To see if it doesn't load the power supply and input signals too much) and a functional test (to check if everything works as it should work) Pictures of this test are below. -Do not take my word for it. Do some internet searching and read what other people have to tell about these clones. 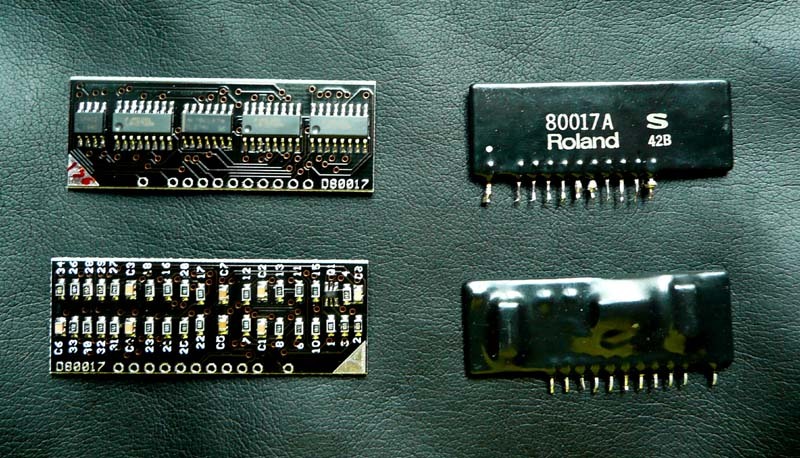 -Installation is straightforward: remove the defective 80017A , replace it with my clone and re-adjust your juno as described in the service manual. -My clones not only sound exactly as the original ones, they also behave exactly the same. 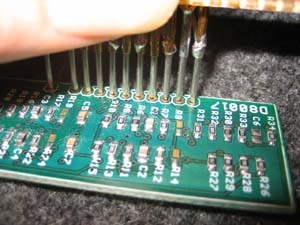 No adjusting of the other voices, no adjustments to the main pcb. 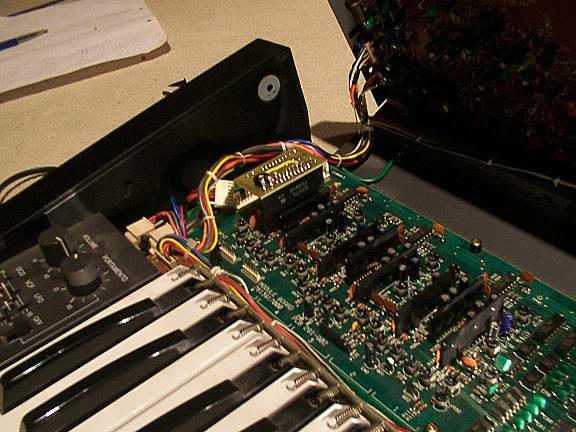 Just do as is told in the ROLAND JUNO-106 SERVICE MANUAL. Nothing less, nothing more. 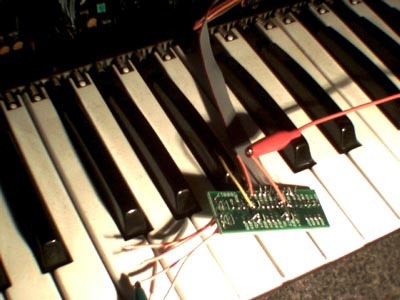 -Although it is straightforward and perfectly described in the juno-106 service manual this requires electronics knowledge and the proper tools: digital multimeter, oscilloscope and frequency counter (frequency adjustment can also be done with a musical instrument tuner or soundcard + frequency measurement program). -Do not believe people who are selling originals or clones who say this is just a remove-replace-play operation. They are lying. Even if you do replace it with an original chip, this adjustment procedure is necessary. Without doing so it won't sound right. -The new version's adjustment is now easier. Due to the closer tolerance, only slight trimming is necessary. Trimpots should all be close to the center position after adjustment. One being way out center is a good indication of something wrong. -One thing you have to be careful about: When doing the adjustment procedure, do not short TP8-TP13! 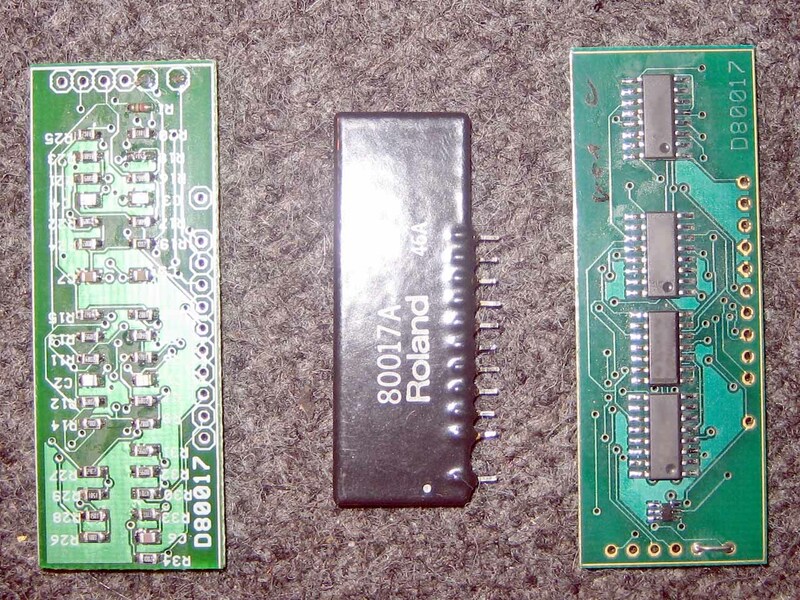 This will fry the output buffer of my clone (the same happens with an original chip). 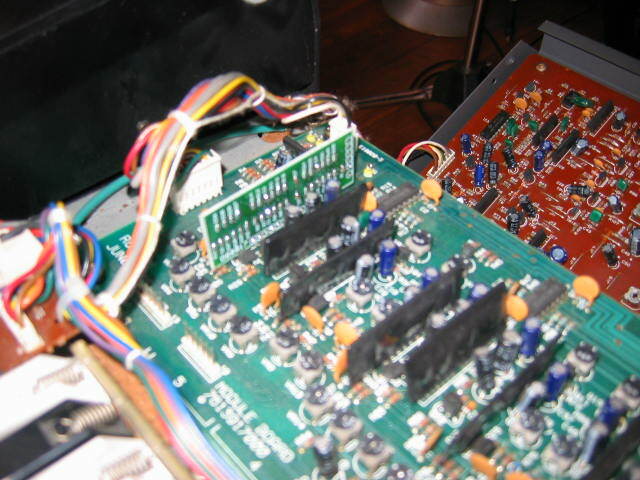 Below are some pictures of a juno-106 with the old vca only pcb installed.